Early this morning, a launch vehicle of the Indian Space Research Organisation ISRO has launched a total of 104 satellites into space. The PSLV-C37 launch carried the CartoSat-2 earth observation satellite as its main payload next to a large number of small satellites. 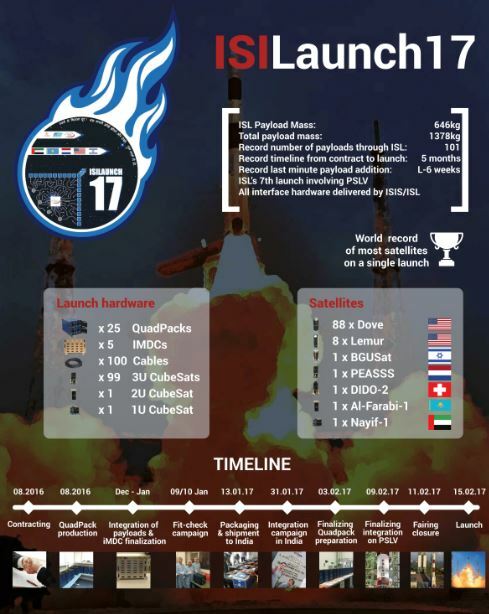 The Dutch nanosatellite company ISIS – Innovative Solutions In Space (ISISpace) was responsible for manifesting a total of 101 satellites on this particular launch. Since 2007, ISIS has been carrying out numerous successful launch campaigns for small satellites through its launch services subsidiary Innovative Space Logistics (ISL) and it is one of the leading players in the small satellite launch business. 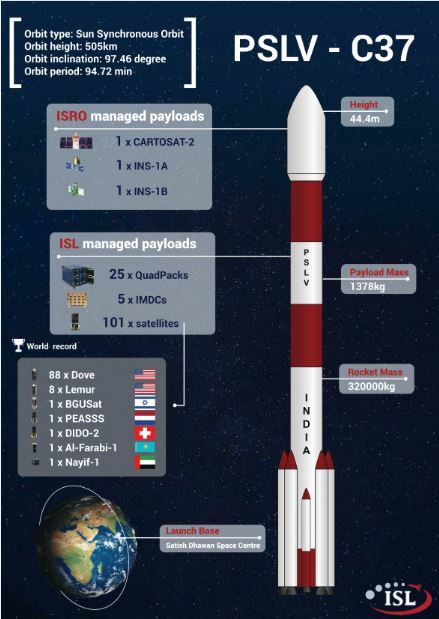 During this ISILaunch17 launch campaign, ISISpace engineers were responsible for the integration of the 101 CubeSats onto the PSLV launch vehicle, using satellite deployer systems and sequencing electronics developed in Delft. In the last couple of weeks an ISISpace team took care of the final integration of all hardware on the launch vehicle at the launch site in India, resulting in the successful launch of this morning. Never before did a single rocket put so many satellites into space in a single launch, a true world record. The number of satellites launched is also significantly larger than the previous record from 2014, in which ISISpace also played a major role with its launch service. This is compatible with a trend in which of small satellites are increasingly used in networks and constellations for a wide variety of applications. This type of satellite launches is expected to be a familiar sight in the years to come. Among these 101 satellites, there are 3 satellites where ISISpace engineers played a major role in the design, development and implementation of the spacecraft. DIDO-2 and Nayif-1 were built by engineers in Delft under contract of ISISpace customers. In addition, the PEASSS-satellite was developed as part of a consortium with the FP7 program of the European Commission, including Dutch development partner and project lead TNO. This launch also marks the start of a cooperation between ISISpace and the faculties of Electrical Engineering and Aerospace Engineering with respect to the research, development and utilization of a distributed ground station network for small satellites in the Netherlands. The PEASSS satellite makes use of this ground station network for its command and control while the network is used to gather telemetry from all 3 satellites that were developed in Delft. 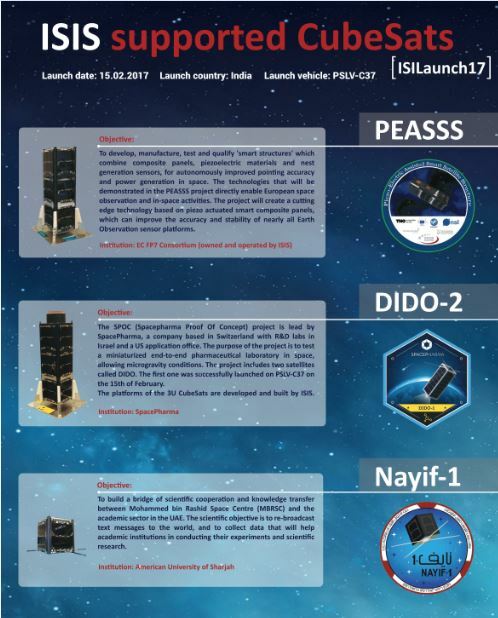 The PSLV-C37 / ISILaunch17 campaign marks the start of a busy year for ISISpace in terms of launch services, with various launches scheduled during the course of 2017.